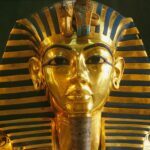 Many of Cairo’s first-time travelers aren’t aware of the city’s assortment of five-star hotels. 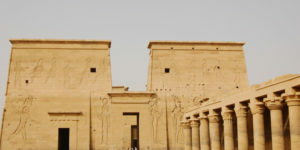 Several of the world’s top hospitality brands have outposts in and around Cairo, leaving visitors a plethora of choices for luxury accommodations at reasonable rates. 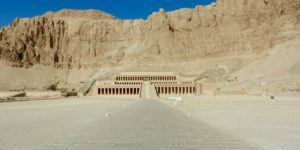 Before committing to any Egypt tour packages, secure your hotel to ensure the best possible location, price, and amenities. If you’re planning a trip to the “Paris of the Nile,” consider these luxury hotels in Cairo where you can sleep, dine, pamper, and mingle in style. An appealing address on the Nile’s west bank and a bundle of bells and whistles make this hotel one of the number one choices in Cairo. 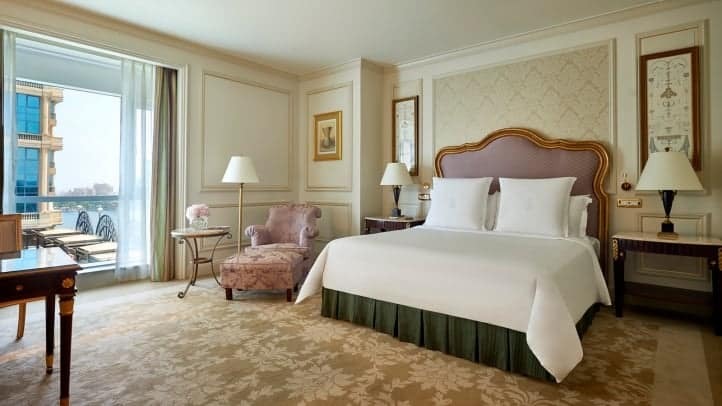 Enjoy elegant accommodations in the French-Empire style and a color palette of muted red, green and gold. Select from a range of rooms including the Premier Room with one king bed and full bath (ideal for a couple or couple with one child) to the Ambassador Suite with three king beds and three and a half baths (for up to nine adults or six adults and three children). A full-service spa, poolside restaurant, lounge, afternoon tea service and the connected Mall at First Residence provide guests plenty of activities on site. The Four Seasons at First Residence is also one of Cairo’s preferred choices for weddings and honeymoons. 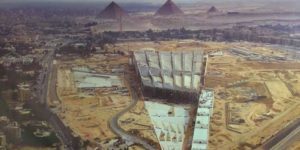 Situated in Giza with the Pyramids looming in the distance, this Marriott property is about 45 minutes’ drive outside Cairo’s center but still in a favorable location. The public spaces make a statement with their ornate detailing and luxurious Egyptian appointments. Meanwhile, guest quarters boast traditional furnishings and neutral colors with scores of dark wood. Mini-fridges, 24-hour room service, and cozy robes and slippers guarantee an extra-comfy stay. 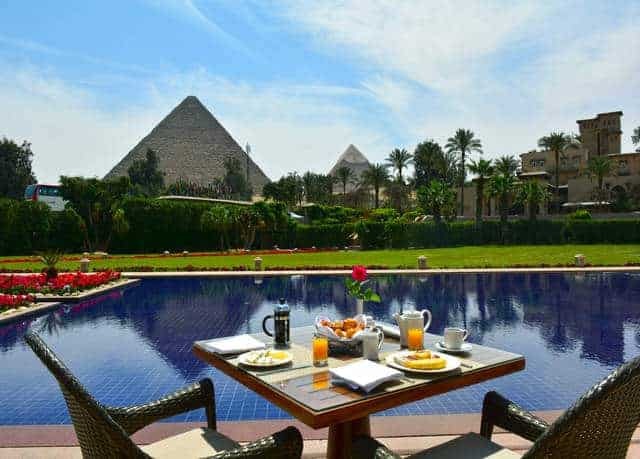 A meticulously landscaped exterior showcases stately palm trees, and the dramatic pyramid views make for a quieter holiday than what you’d experience in downtown Cairo. This boutique hotel in the Garden City District shines with Egyptian detail in the lobby but takes on a European sensibility in guest rooms. Look forward to personalized service here. The concierge can recommend the must-see attractions and secure reservations; 24-hour butlers are included with each room, and the Lady in Red ambassadors tailor each guest experience. Meanwhile, four dining spots are sure to impress – The Blue for Italian classics and Osmanly for Ottoman cuisine, as well as the Chocolate Lounge and the Jazz Bar. A luxury spa, fitness center, rooftop pool, Nile River views, and a convenient location that’s a quick drive to Cairo’s main attractions are excellent reasons to book a stay at Kempinski Nile Hotel. Set on the southern tip of El Gezirah Island, this hotel features 433 elegant rooms and suites with Oriental detailing, signature My Beds, and private balconies. Rooms vary from king rooms for two to sprawling suites for families. 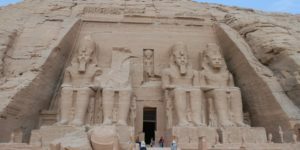 This location offers the best of both worlds as you’ll feel removed from the manic city center yet be near all of the top sights and attractions, setting you up for excursions around Cairo and luxury Egypt tours. 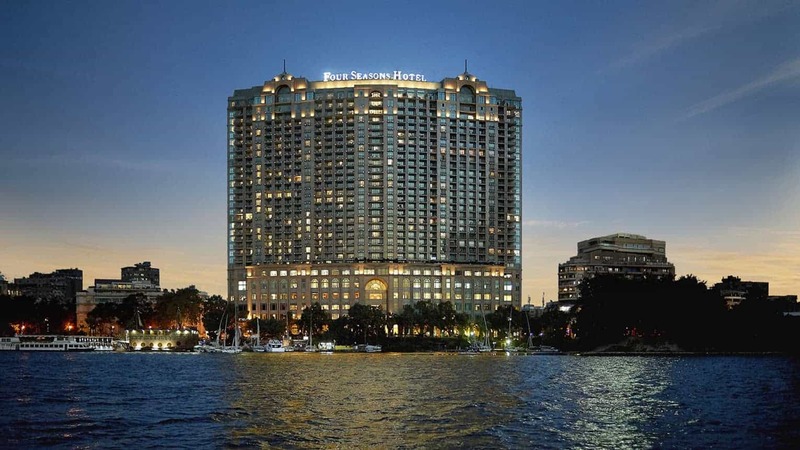 Hotel Sofitel Cairo El Gezirah features an excellent breakfast, six restaurants and bars including a floating deck with cuisine by the Michelin-star chef Laurent Peugeot. Butler service is the icing on the cake. This Hilton hotel offers 11 room categories, six restaurants and bars, sauna and steam rooms, as well as the Conrad casino for gambling guests. A 24-hour fitness center comes complete with trainers, and massage therapists are on hand for a Swedish or Thai treatment. Rooms are traditionally decorated with handsome furnishings including antiques and formal draperies. Suites come equipped with kitchens and dining areas, ideal for families with kids. 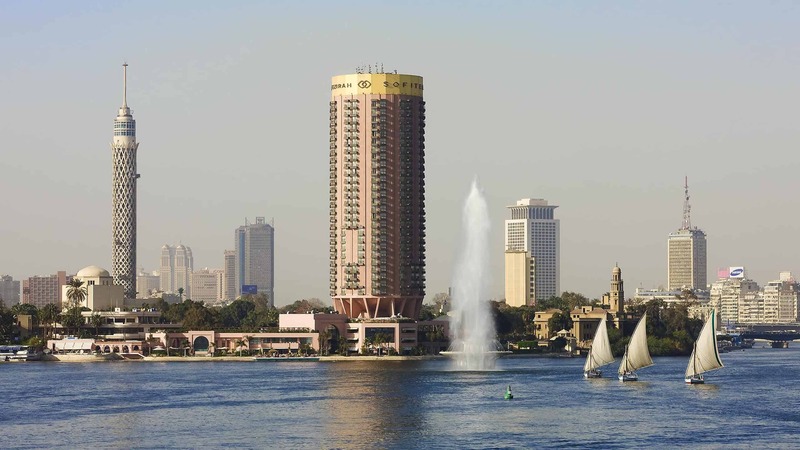 All guest quarters at Conrad Cairo feature city and Nile River views. Halfway between Cairo International Airport and the city is this upscale hotel in Heliopolis. Concorde El Salam boasts Georgian style architecture, 320 rooms, 18 suites,14 rooms poolside, and an extensive list of amenities. Need a babysitter? Check. Free transfer to and from the airport? Check. And if you’re feeling under the weather, there’s a doctor on call. Other perks include free movies and in-room coffee. Stay in an executive level room and you’ll have access to the Executive Lounge. Also take advantage of free breakfast each morning and cocktails and snacks throughout the day. All 540 rooms at this Fairmont property provide magnificent vistas of the Nile, pyramids or the city. Art Deco-inspired interiors take center stage along with the Willow Stream Spa and the rooftop poolside sky bar. You won’t go hungry or thirsty at the Fairmont Nile City either. Sate your appetite with Napa Grill’s California-style cuisine, Saigon Restaurant and Lounge’s Asian fusion, or at the Middle Eastern Bab El Nil. If a celebration is in order (or just some sparkle), pop into the glitzy Champagne Bar for a glass of bubbly. 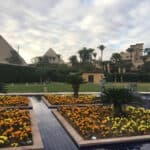 The stellar service, lavish interiors, and of course, the Nile River panorama attract tons of visitors to this Ritz property that’s minutes to Tahrir Square and the Egyptian Museum. 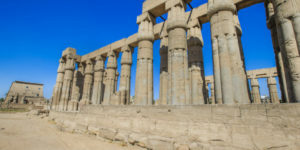 Spoil yourself with a spa treatment; dine and drink in one of the nine on-site bars and restaurants; exercise in the state-of-the-art fitness center or decompress after a full day exploring the streets of Cairo. The Nile Ritz Carlton is a solid choice for couples, groups, and families too. Ritz Kids offers fun, engaging activities for younger travelers, focusing on the natural wonders and age-old traditions of Egypt. Stay in one of the city’s more charming (and calmer) districts away from the hustle and bustle of Cairo’s center yet in proximity to all that the city offers. 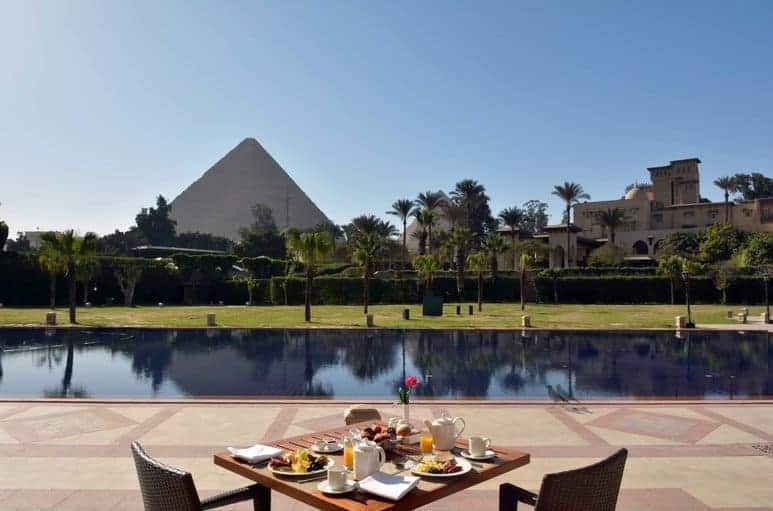 A Garden City gem, this hotel promises far-reaching views of Cairo, the pyramids and beyond. Anticipate the usual Four Seasons luxuries such as a stocked minibar, cozy bathrobes, down pillows, and free Wi-Fi. And the bonus? This Four Seasons Nile Plaza is the home of Zitouni, a spot serving authentic Egyptian fare and also regarded as one of the best restaurants in Cairo.